It’s true that the graphic story medium remains a ghetto, even though successes in the last couple of decades such as Moore’s Watchmen and Spiegelman’s Maus did a lot to renovate it. The majority of American comics, and the graphic novels collected from them, are filled with what Cory Doctorow calls underwear perverts, otherwise known as superheroes. Japanese comics, while exhibiting a wider variety, have a similar issue in that much manga simply repeats what has been successful in the past, and a lot of what is now being brought to our shores reflects only the lowest-common-demoninator. Which means that a collection such as this new one from The Best American series should be able to highlight the exciting and important work that is being overshadowed by the claptrap. Unfortunately, it falls victim of a different problem: pushing graphic work as the best simply because of its level of being outre, rather than being good. There’s some interesting comics in this collection, but a lot of it just leaves me with a feeling of “bleah,” even those comics from creators I had previously enjoyed such as Chris Ware and Lynda Barry. The best of this best of collection are the longer pieces, such as the Joe Sacco embedded reporter in Iraq, the autobiographical piece by Robert Crumb (although does he ever not do autobiographical? ), the stranded in the dessert short by Anders Nilson, and the fascinating story of the bus trip in Mexico with the crazy lady by Justin Hall. I also was intrigued, although still confused, by the non-verbal piece from Rebecca Dart that lived by its own rules and was probably the most successful of the experimental work collected here. In page count, that was probably half of the book, and made the price worthwhile, but I still felt slighted somehow, because of the stuff I didn’t like, I really didn’t like it. This is in contrast to my experience with other Best American collections, which usually have enough variety that you’re not going to be “wowed” by everything, but rarely contain stuff that is just dreadful. One of the most glaring omissions, which unlike the superhero comics isn’t even mentioned by Pekar in his mea culpa of an introduction, is no material published in mainstream newspapers such as examples of daily humor strips or editorial cartoons. You could make a case against the latter, I suppose, as they are more “set pieces” than short stories, but many daily strips have a storyline that would lead to excerpted collection. Even the restriction against editorial cartoons seems fragile compared to some of the inclusions herein. 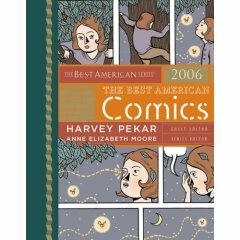 While I do not fault the editors (Harvey Pekar is the guest editor for this inaugural volume) for not selecting anything from a mainstream publisher, given the selections that they did make I wonder about the criteria that they used. The collection was interesting, but I’m not sure I’ll pick up the 2007 edition based on my experience with this book.